Scholarship applicants are drawn from full or part-time students or members of STEM organizations. To apply, they submit a details about their school and class schedule, and are tasked with building a Swift playground to show off their interests and creativity in code. Winners are invited to the week long conference and are given accommodations during their stay. Batista described staying at the nearby San Jose State University dorms with other scholarship winners, where they were able to meet and discuss ideas with other scholarship attendees from around the world, from Italy to Brazil. Batista is originally from New York, where he graduated high school last year. He's been living in San Francisco for the last year after enrolling the Make School Product College, a Y Combinator-backed alternative college focused on computer science and product development with the goal to "empower students to build and ship products." Batista was one of 50 students accepted to Make School, and recently finished his first year with the program. 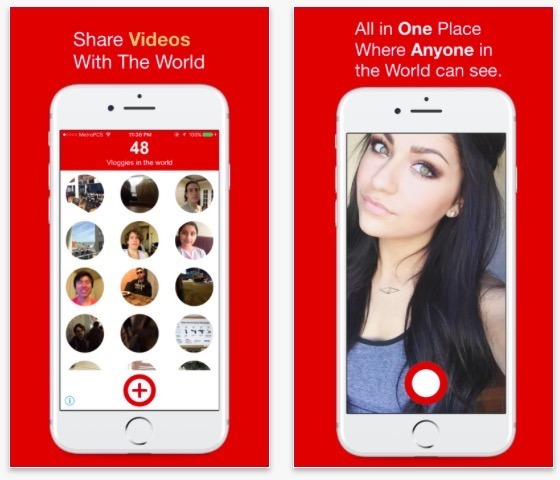 Prior to applying, Batista had built three apps already listed for sale in the App Store, including Vlogr for recording and sharing video journals, and Findr for looking up public contact data from social media accounts. To apply, he submitted a Swift playground that created a graphical visualization designed to depict Apple's core values related to diversity and inclusion: a series of retro Apple logos rendered using the CAEmitterLayer framework, as an outline of colors frame the animation using UIBezierPath. Already located just an hour drive from San Jose, it was less of a trek to WWDC for Batista than many of the attendees from all over the world who converged at WWDC with more jet lag to work through. The day before the Keynote, Apple hosted scholarship winners at a breakfast reception where they checked in, got their conference badges and were given a developer edition Apple TV for building and testing tvOS apps--as well as a WWDC Levi's jean jacket with collectable pins featuring various iOS and Mac technologies as well as a flag pin identifying their home country. The scholarship orientation also featured a variety of presentations from core teams at Apple sharing their experiences in working to solve engineering problems, including a segment by Apple's fitness and health chief Jay Blahnik discussing Apple Watch and its Activity app using gamification as a way to drive users to stay active, sit less and get more exercise. When they assembled on stage take a group photo, Batista reported that they were surprised by an appearance by Apple's chief executive Tim Cook, who stopped to take selfies with the group and individual students. When he asked an Apple engineer named Lemont what advice he'd give a young programming getting started, he said he was told, "Learn to balance your work life, don't try to brute-force a solution. If you're stuck on a problem, don't keep trying to solve it over and over again during the same time--instead go outside and do a physical activity and come back to your computer in a few hours. Now then will you have a much better approach at solving the problem." Apple seated its scholarship attendees front and center for its Monday keynote address, where Cook largely skipped the usual overview of Apple's sales figures and went straight into a series of six major areas of new releases, including iOS 11, macOS High Sierra, new iPad Pro models featuring ProMotion displays, faster new MacBooks and new iMacs including a sneak peak at the new iMac Pro, watchOS 4 and the new HomePod speaker unit. This year Apple also featured a series of special sessions, including a conversation with Michelle Obama and Apple's Lisa Jackson and a series of lunchtime presentations by Dr. Christine Darden, Todd Stabelfeldt and Miral Kotb. I met up with Batista during a break in sessions, and spoke about some of the technologies and products announced at WWDC. In particular, he noted the new ARKit in iOS 11, which turns modern iPhones into the world's largest augmented reality development platform. We also discussed the new Depth API for calculating Z axis depth-disparity using the twin cameras of iPhone 7 Plus. Apple used the technology internally to create the shallow depth of field effect for Portrait mode (which we used to capture Bautista's photo in the shot above), but at WWDC it outlined new APIs for third party developers to use to create their own unique dual-camera effects. Batista also later joined Victor Marks and me for episode 124 of the AppleInsider podcast, where he discussed how being able to attend the conference opened up many connections with engineers at Apple and other developers, and how he found solutions at onsite labs to some of the development issues he'd run into while working on projects of his own. 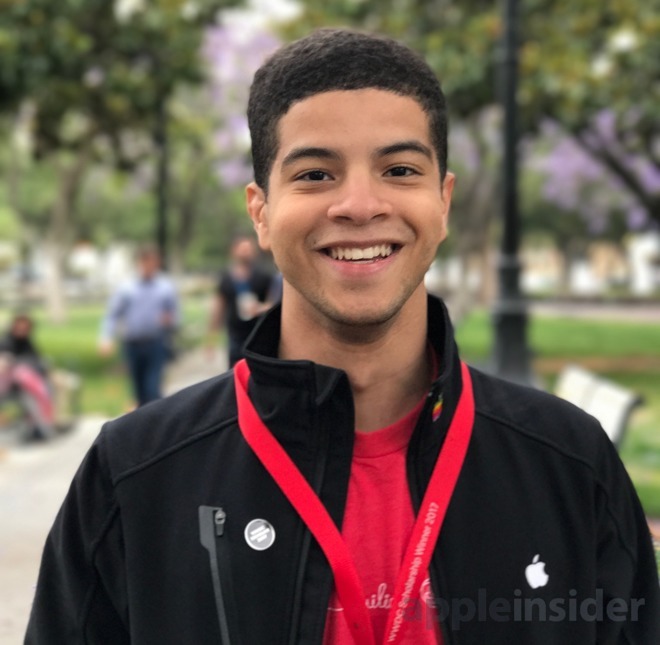 Apple has offered a WWDC scholarship program for over a decade, but expanded it significantly starting in 2014, when we met with three students out of the 200 that Apple invited, a big jump from the previous year's 150 student attendees. Over the last few years, the total number of WWDC attendees has remained at just above 5,000 (this year's crowd numbered 5,300--the largest so far). That's constrained by the limitations of crowd control and meeting space, as well as personal access to Apple engineers. However, the number of students invited to attend has continued to increase, with around 300 invited this year. Cook noted the youngest student being ten year old Yuma Soerianto from Melbourne, Australia. Student attendees certainly enlivened the WWDC17 Bash, which this year featured post-punk band Fall Out Boy. At the other end of the age spectrum, Cook also introduced 82 year old Masako Wakamiya of Japan, who didn't start using computers until 60, but now has her first title on the App Store. Apple has also worked to make the information in WWDC sessions available to all of its 16 million registered developers (3 million of whom are new this year), who can stream most of the sessions live or download them for later viewing. Apple has also continued to expand its efforts to improve upon its development tools with Xcode 9, with particular new efforts devoted to making it easy for educators to teach programming using Swift Playgrounds on iPad, including new support for working with real world devices including Lego Mindstorms, drones and other robotic devices.